The Toronto Star should get its facts straight and stop distorting Rwanda’s tragedy. The Star should check Dallaire’s fax more closely. Revealingly, the much-celebrated “genocide fax” the editorialists reference is not titled “‘genocide’ or ‘killing’ but an innocuous ‘Request for Protection of Informant’”, reports International Criminal Tribunal for Rwanda (ICTR) lawyer Christopher Black in a 2005 story titled “View from Rwanda: The Dallaire Genocide Fax: A Fabrication”. The two-page “genocide fax”, as New Yorker reporter Philip Gourevitch dubbed it in 1998, was probably doctored a year after the mass killings in Rwanda ended. In a chapter devoted to the fax in Enduring Lies: The Rwandan Genocide in the Propaganda System, 20 Years Later Edward S. Herman and David Peterson argue two paragraphs were added to a cable Dallaire sent to Canadian General Maurice Baril at the UN Department of Peacekeeping Operations in New York about a weapons cache and protecting an informant (Dallaire never personally met the informant). The added paragraphs said the informant was asked to compile a list of Tutsi for possible extermination in Kigali and mentioned a plan to assassinate select political leaders and Belgian peacekeepers. At the ICTR former Cameroon foreign minister and overall head of the UN mission in Rwanda, Jacques-Roger Booh-Booh, denied seeing this information and there’s no evidence Dallaire warned the Belgians of a plan to attack them, which later transpired. Finally, a response to the cable from UN headquarters the next day ignores the (probably) added paragraphs. Herman and Peterson make a compelling case that a doctored version of the initial cable was placed in the UN file on November 27, 1995, by British Colonel Richard M. Connaughton as part of a Kigali-London-Washington effort to prove the existence of a plan by the Hutu government to exterminate Tutsi. Even if the final two paragraphs were in the original version, the credibility of the information would be suspect. Informant “Jean-Pierre” was not a highly placed official in the defeated Hutu government, reports Robin Philpott in Rwanda and the New Scramble for Africa: From Tragedy to Useful Imperial Fiction. Instead, “Jean-Pierre” was a driver for the MRDN political party who later died fighting with the Rwandan Patriotic Front. Doctoring a fax to make it appear the UN had foreknowledge of a plot to exterminate Tutsi may sound outlandish, but it’s more believable then many other elements of the dominant narrative of the Rwandan genocide. The day after their editorial, for instance, the Star published a story titled “25 years after genocide, Rwanda rebuilds” which included a photo of President Paul Kagame leading a walk to commemorate the mass killings. 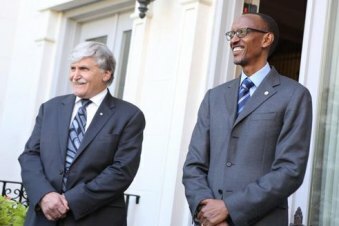 But, Kagame is the individual most responsible for unleashing the hundred days of genocidal violence by downing a plane carrying two Hutu presidents and much of the Rwandan military high command. Even the Star has reported as much. A year ago they published a story titled “Did Rwanda’s Paul Kagame trigger the genocide of his own people?” For its part, the Globe and Mail has published a series of front-page reports in recent years confirming Kagame’s responsibility for blowing up the plane carrying Rwandan President Juvénal Habyarimana, which triggered mass killings in April 1994. In an October story titled “New information supports claims Kagame forces were involved in assassination that sparked Rwandan genocide” the Globe all but confirmed that the surface-to-air missiles used to assassinate the Rwandan and Burundian Hutu presidents on April 6, 1994, came from Uganda, which backed the RPF’s bid to conquer its smaller neighbour. (A few thousand exiled Tutsi Ugandan troops, including the deputy minister of defence, “deserted” to invade Rwanda in 1990.) These revelations strengthen the case of those who argue that responsibility for the mass killings in spring 1994 largely rests with the Ugandan/RPF aggressors and their US/British/Canadian backers.